When Josie Marshall’s detective husband, Gabe, is found naked outside their beachfront home with a bullet in his brain, everyone calls it suicide. Josie believes it isn’t. . . but fears it could be. After all, she had provided Gabe with a motive. Grief-stricken and guilt-ridden, even Josie begins to believe Gabe may have shot himself. Josie is like no other character you’ve ever met in a mystery novel, and the beach strip is like no other place you’ve ever visited. 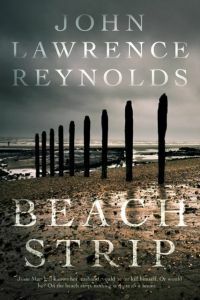 As Josie attempts to prove that her husband’s death was not a suicide to ease her guilt, she is carried toward the dark corners of the beach strip and the darker sides of its residents, one of whom dies a horrific death literally at Josie’s feet. Fending off her fears with humour and outrage, Josie encounters a drug-crazed drifter, an angry and threatening police superintendent, an organized-crime boss with romance on his mind, a woman with a murderous past, and a pervert who’s been frequenting Josie’s garden shed. She wants only to clear her husband’s name and prove—to herself and everyone else—that her husband didn’t abandon her. Standing between her and the truth are Gabe’s former colleagues in the police force and her own dark secrets.